Happy Friday! Time for another Bloggers Challenge - this week, I gave the challenge players this sketch to use for inspiration in creating their card. If you'd like to join us, just leave a link to your card using this weeks challenge in the comments section. 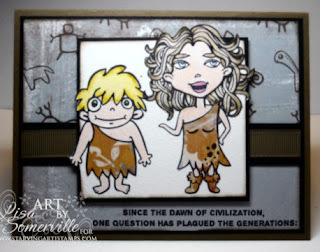 To create my card, I inked up the newly released DoodleFactory Prehistoric Set & Sentiments from Starving Artistamps. The mom and son are stamped in Black Archival on Watercolor paper, paper pieced with some Perhaps Basic Grey DSP, then colored using the Marker Watercoloring Technique. I did add a touch of Spica Glitter Pens as the Eye, Lip and Eyes Shadow colors. Once colored and paper pieced, I used the Out of the Box Technique to frame the image a bit, sponging the edges in Soft Suede. 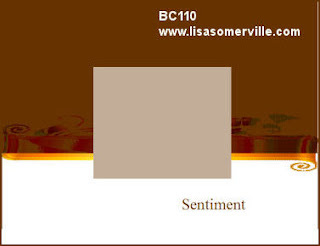 The small hand drawn stamps from this set are stamped in Soft Suede on a piece of Basic Grey Perhaps DSP. I did create a small strip to match the doodle drawings for the inside of the card - where you can view the rest of the sentiment. Such a great sentiment to go with the images, don't you think? 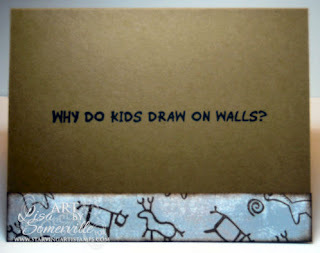 I think as kids we've all drawn on the walls at least once! Thanks for stopping by. For more inspiration using this weeks sketch, be sure to click on the Bloggers Challenge Logo on my side bar. Have a great weekend! It's a very unusual stamp set, but I really like what you did with it. How funny! I love this. TOO much fun! I love it! Oh this card is funny. My kids were hair cutters rather than wall drawers. I love what you did with these images!!! The out of the box was perfect for her "Farrah" hair! Super cute! OMG How funny! I couldn't wait to see what the inside said (so glad you shared both). What a hilarious card. lol!! this is hilarious! great card! The answer is - because they can...when you're not looking. :) I love the fun images you used! too cute! This card is a hoot! Love it!! I love the inside and the outside reminds me so much of the Flintstones. super cute, Lisa! Those images and the sentiment crack me up! OMG, this is too darn cute! Great images!